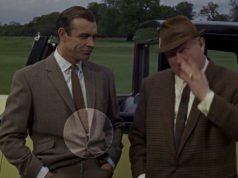 Let’s go back to Goldfinger and take a look at everyone’s favourite, the grey and white glen check, tropical-weight three-piece suit made by Anthony Sinclair. 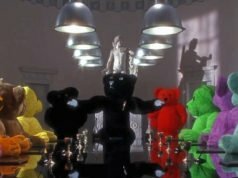 James Bond wears five suits in the film but this is the one that everyone remembers most. It’s not a solid light grey but as you can see in the close-up below it is really a fine glen check in dark grey and white. This fabric is woven in a 2×2 hopsack (basket) weave with a high number of ends and picks per inch. A diagram of the fabric can be seen in the illustration below. Holland & Sherry has a black and white version of this cloth in their Perennial Classics book: #644013. 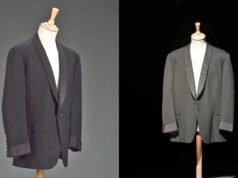 The jacket is Connery’s usual button two with narrow lapels, this time with double vents, straight flapped pockets and a ticket pocket. The cuffs, as usual, close with four buttons. The shoulders are natural, the sleeve heads are roped and the chest has a little drape. The trousers have the typical double forward-pleated front with Daks tops side-adjusters. The side adjusters have tabs that fasten to one of three smoke mother-of-pearl buttons on each side. The side pockets are slanted and jetted, offset from the side seam. 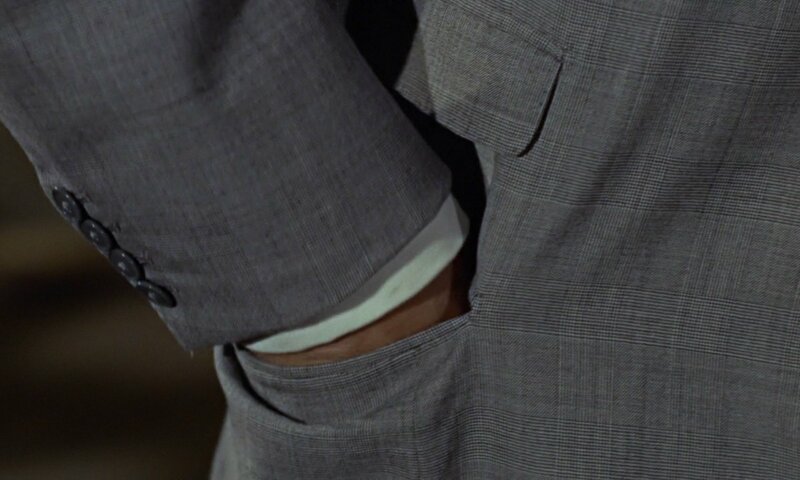 Unlike the suit trousers Bond wore in his first two films, the trousers in Goldfinger are finished with plain bottoms instead of turn-ups. The waistcoat has six buttons, with only five to button. The bottom button is placed on the cutaway part so that it cannot possibly be fastened. The waistcoat has notch lapels and four welted pockets. The back is made in the same dark grey lining that the rest of the suit in lined in. There is a strap across the back for slight adjustments. The shirt is white with a faint broken grey stripe and has a spread collar, a front placket and double cuffs with rounded corners. The tie is a navy silk knit, the kind with a square bottom. Knitted silk ties are usually too casual or sporty for a worsted suit, but this is a very sporty suit, and thus the knitted tie goes well with it. Bond wears a folded white linen handkerchief in his breast pocket. Bond wears two different pairs of black shoes with this suit. Most visible are a pair of black two-eyelet derby shoes, but Bond also wears a pair of black slip-on short ankle boots with elastic side gores. Bond bridges the gap between his light grey suit and black shoes with dark grey socks, providing a transition between the two. Perfection. simply perfection. too bad none of the other Bond actors were able to achieve this level of timeless style. This is one of my favorite office combos (sans waistcoat) though I sometimes substitute a pale blue shirt. Wonderful post, thank you. This is absolutely my favourite suit of any Bond film, and just looks classic in every shot it's in. I'd love to copy this suit myself, so thanks for all the useful info. The daddy of them all. Perfection. Thank goodness we have a custom tailor in Kansas City. I’ve had one of these built (as per the specs from this website) and plan to wear it at a Kentucky Derby party at the Kansas City Club. What tailor in Kansas City do you speak of? I have just had mine made by Anthony Sinclair, I cannot begin to tell you how amazing this suit really is!!!! It is beautiful to look at and sublime to wear. I also had a shirt made, incredible!! When I put the shirt and suit on, it felt as if everything I have ever purchased and worn has NEVER fitted me. Please, if you want an exceptional suit and or shirt, definitely and I mean DEFINITELY buy from Anthony Sinclair! What’s the closest off-the-rack approximation of this suit that anyone has purchased or seen for sale? Thanks. Upon reviewing the film last evening, I couldn’t help but note that the suit jacket for this ensemble runs rather on the short side (by 1 or 2cm) of what is usually claimed as traditional. Yet, the proportions are absolutely spot-on. I’m almost tempted to say that someone in the chain of command of the Skyfall suit development made note of this and very poorly translated the shorter cut of the Goldfinger suit into the 2cm-too-short disasters that are Craig’s suits in Skyfall – thinking they were somehow creating a homage to the original. Was it a wash in the bag suit? I absolutely love this suit. I’m trying to get the fabric to let my custom tailor make it for me. Has anybody an idea, where to get the fabric? Holland and Sherry has a very similar cloth. 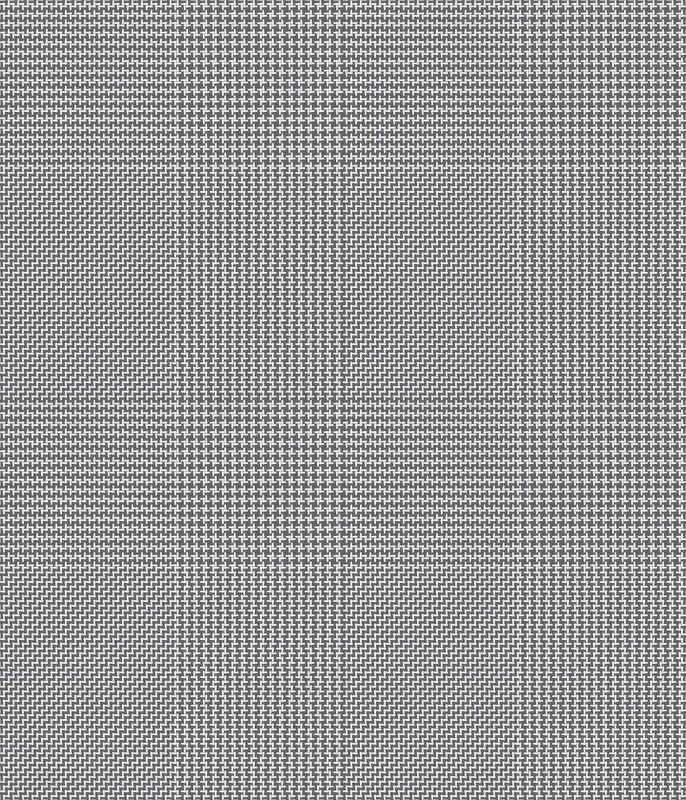 Make sure it is just black and white or grey and white (which you probably won’t find), and without a coloured overcheck. 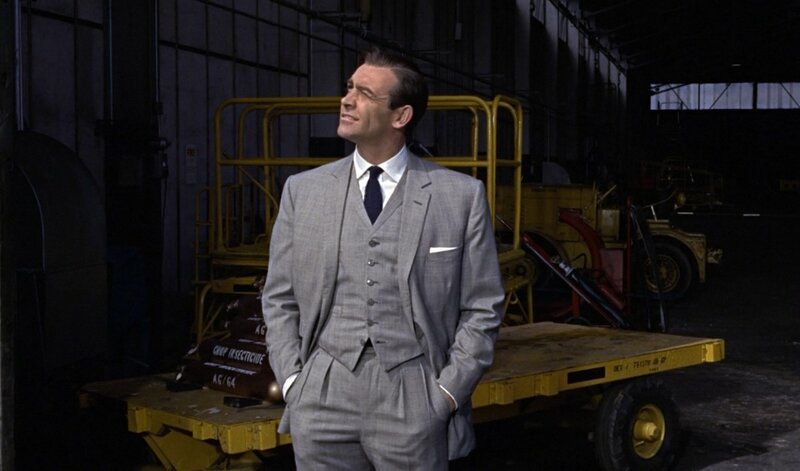 What is your opinion on the re-elaborated Anthony Sinclair “Goldfinger” suit ? They are able to make something very similar to the original if you get it bespoke. The Special Order suit is different than Connery’s suit since it has a cleaner chest and shoulder padding, making it look more modern. My friend and custom tailor Bob from “Gino Suits” made me one of these, wonderful! When ever I am getting out of my car, it gives me a little Bond feeling ;-). If it happens, that you are reading this right now Bob, you are the man! Did you see the adverts of Prada with Christoph Waltz? They are trying to copy the 1-2 cm too shoort style too, but it never ever looks that great as it does when Sean Connery is wearing it. Great review with quality detail, thanks. Now don’t laugh but I bought myself a suit from Matalan (the UK high street clothes store known for its low prices) for £90. Single breasted, two button, twin vent, ticket pocket and five button cuff in a plain Prince of Wales check wool mix. The trousers are flat fronted (a shame) but narrow enough in the leg with no cuff. I didn’t bother with the waistcoat as it has no lapels. It’s called the Madrid if you want to check it out. I’m not trying to advertise for Matalan, but if your a UK based fan of Bond suits I say it’s well worth looking at. I just had this suit ,made in Australia by a company called Zinc and Sons. Fabric came from the original supplier in the UK. Just fantastic suit. The service and the fittings all went well but the finished product is just wonderful. The fit is perfect and the suit is a direct copy of the one mage by Anthony Sinclair. Call me Bond! You are amazing – what great analyses!! Let me say – this has never been my favorite Sean Connery Bond suit. Yes, it is amazing. But for me, too dandyish. Also, a little too much like a rich guy suit. I preferred Connery’s more working man suits – rendered first class by the tailors – like his typical suits. The blue suit for example earlier in Goldfinder he wears with Q. A question on this suit. One thing that always bothered me about this suit is the fit of the pants – they seem to drape funny. Is this perhaps due to the shoes he is wearing with the suit? I believe they were actually shoe boots – high top boots? The shoes Bond wears wears with this suit are three eyelet derbys, not the boots he wears with some of his other suits. I have just collected mine from an ex Huntsman tailor. Just love it! 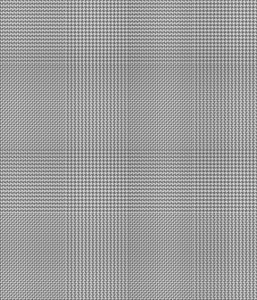 Used the Holland And Sherry black and white glen check and the specifications from this site. Thank you so much. I’m wearing it with a black cheany monk shoe. However I was able to order the fabric via my tailor [Weng Foo of Brunei] who was given the order catalog by his Holland and Sherry distributor back in October 2015. I will post the pattern number once I revisit my tailor for your kind perusal. The knit tie is it black or dark navy ? What are your thoughts on pairing a midnight blue tie with this suit, instead of navy? Connery dons midnight blue with the grey sharkskin suit in Thunderball, though of course it is not an exact comparison as the suit and shirt are darker than what we have here from Goldfinger. There’s no fine line between navy and midnight blue, so you’ll get the same effect. That is interesting – thank you, Matt. Any idea what types of buttons would be used on the gray suit? The buttons are plastic, as like on most of Connery’s suits. Today black or brown horn, grey urea that looks like horn, or grey corozo buttons would be more common on a quality grey suit.